Lee Kelly just turned 85. Through June into mid-July he is showing new work at Elizabeth Leach Gallery. 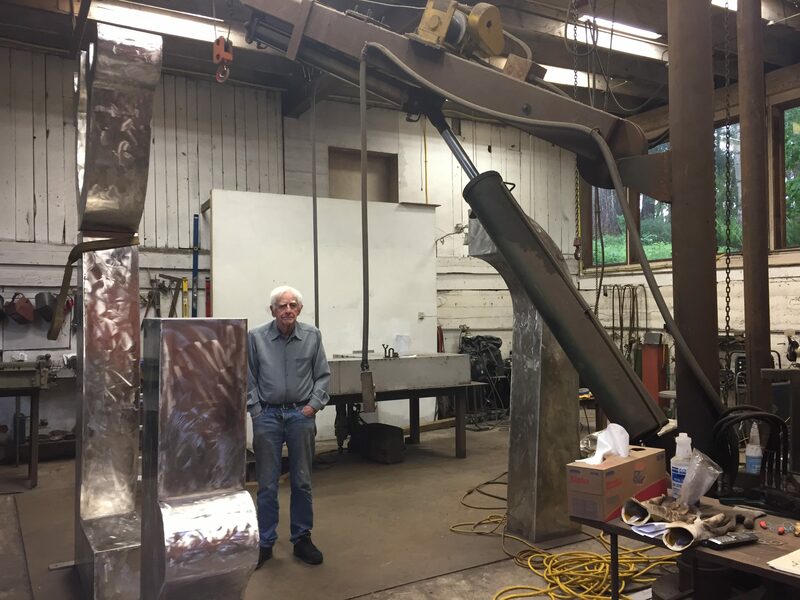 Over a career of almost 60 years Kelly has completed dozens of public and private sculpture commissions. 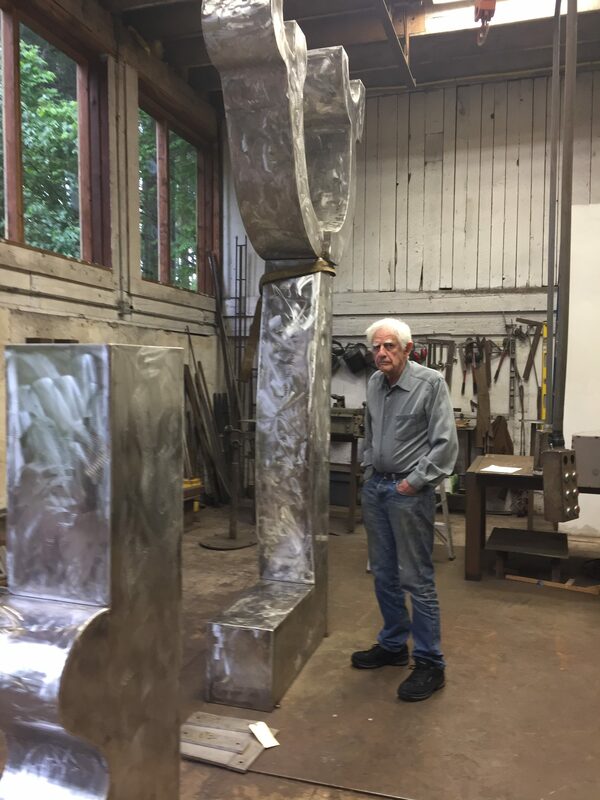 He has major works on the Portland Transit Mall and the Rose Garden in Washington Park. He lives and works on what was a dairy farm in Oregon City; the barn is now a shop/studio. What was pastureland 50 years ago is now reforested and populated with Kelly’s sculpture. You grew up in Idaho. Did you go to high school there? No. I came out here. Roosevelt, but I went back there and did ranch work in the summer. Why? Because you couldn’t find work in Portland? I loved the idea of horses and doing all that. maquette for the sculpture at right in the background. So now you got a sculpture farm next to horses. When you were at Roosevelt High School did you do any art there? I tried to, but I got crossways with the teachers. In general or just the art teachers? Just the art teachers. So then I found a guy who was teaching mechanical drawing and that’s where I gravitated. He did a lot with geometry and how you can put stuff on a page to communicate to somebody else. Mr. McMillan. What do you think he did that connected with you? I think I enjoyed the rigmarole of drafting. That’s why you thought about architecture? Probably. I didn’t know what the hell to do at that point. There were no real career objectives. Going to architecture school was pretty much out of it. I went to Vanport college [Vanport Extension Center, now Portland State University] and the route from there down to the University of Oregon was pretty bad, if you didn’t have a little bit of money. You had the G.I. Bill when you got out of the Air Force? When I was going to the Museum School [now Pacific Northwest College of Art]. I was about to be drafted. And you decided the Air Force was better? It was the Air Force reserves unit at Portland Airbase. It was a whole Air Force wing. They had to keep all these planes going. They were all World War II guys who came home and wanted to have something to do on the weekends, so it seemed like a real good deal. There was an opening as a draftsman so I signed up. About a month after I signed up, they activated the whole damn unit. Then it took me almost 4 1/2 years to get untangled. That included the Korean tour. But that was important for you. Yeah, it was a real big deal. Were you interested in Asian cultures before you went to Korea? No, but I sure took the bait when I saw it. I had more access to Japan than Korea. We were sort of constrained in Korea as far as interacting with the population. Whenever you left the base you had to carry a gun. How much time did you spend in Japan? We had an R&R thing. You got about three of these in a year. I think it was four days and I always went to Tokyo. You got an airplane ride to Tokyo and back. I must’ve done that three times because the fourth one was when I hitchhiked up to the front. So you had about 12 days in Japan, but it had an effect on you. It was a huge thing. You were turned loose in the middle of Tokyo. In 1952 the old Imperial Hotel [by Frank Lloyd Wright] was still standing. It survived the firebombing. The Japanese really rebuilt in a hurry so you didn’t see much effect in Tokyo. When was the next time you went to Asia? I started going all the time, mostly to south Asia and Nepal, in the 70’s. A somewhat different culture from Japan. But still I got really comfortable with the art forms. Indian art is certainly different than Japanese art, but you get the idea. Japan is a real post and lintel society—thinking about your work. When you get in the Southeast Asia you get a lot more curves. They never developed a spring arch. They did what they call a corbeled arch. Superficially in the Mughal period (1556-1857), they would use what looked like arches, but they weren’t structural. It’s my impression that you’re much more interested in Asian thinking than European thinking. I don’t care much about Europe. I’m a fan of some of the art because I went to a pretty much traditional art school so I can identify a lot of stuff. But in terms of your day today attitude about things I would say you’re much more East than West. Look how much closer we are. To go to Europe you’ve got to get clear over a continent and another ocean. How would you characterize your development of sinking into an Asian frame of mind? In terms of thinking I probably never did. I think I just assimilated whatever it was and it became pretty much part of the way I operated. Travel was always a big deal for me—for getting ideas. I did a lot of looking in Central America too. It wasn’t just Asia. You went down there before the Nepal trips? Yeah, particularly the Yucatán three or four times, and finally Central America and further on down to Chile and Argentina. It seems that in those cultures the attitude seems to be a little more relaxed than going the other direction going to New York or Europe. Maybe that has something to do with the Portland area or Idaho? Portland’s becoming a really interesting town for me. I think it always has been. People say to my detriment. You got this land and developed your sculpture garden. And there’s nice young people coming out here and doing stuff. PNCA does an artist-in-residence program out here now. So far, Portland is a very welcoming community. We have a viable art scene. Lee Kelly in his studio/shop. “Winter Garden at Muktinath” in process at left. It’s been viable for you. Well, yeah. I don’t have to toe any kind of line as far as style and so forth. I don’t think that anybody here feels that they do. We’re not really trying to impress anybody here. Well, I guess we haven’t. I think we’ve been successful. What were your expectations when you got out of school in terms of being an artist? Pretty much zero. That’s just what you were doing and you supported yourself by doing something else. We’re still around, which is sort of amazing. So what are you working on now? You’re painting again. You’ve gone from being in a painter who became a sculptor to now being a sculptor who also does painting. Painting a little on the side. Painting is hard to do. Sculpture’s kind of plodding and predictable. When you decided to stop painting in ‘63 or ‘64 did you kind of miss painting? When I got out of school, I was doing both. I remember I was in some show at Reed. The show was built around the idea of sculptors who paint. The argument came down that was I was more of a painter who did sculpture. But you didn’t miss the idea of putting paint on canvas? It got so I couldn’t. It wasn’t that I decided not to. I couldn’t do it anymore, for a long long time. Do you approach painting differently from how you did it 50 years ago? It’s quite different. I damn near design them these days. More of the attitude you take making a sculpture, figuring out a sculpture? Occasionally there’s even a preliminary drawings. I hate to confess that. So much for that abstract expressionist idea. That thing had a kinda good run though. Talk a little about your process of making sculpture. You were saying earlier that it is s different from painting, which goes from brushstroke to brushstroke. Are you starting with sketches for sculpture? They seem to have a pattern. I mean, I don’t schedule it much. I’ll plow through some old sketchbooks and one of the things I’ve gotten out of computers—I don’t do any CAD kind of stuff at all—I’ll scan a little sketch, a little tiny thing. Then I can blow it up and start messing with it—enlarge it and make tracings, collages, cut it out and reprint it, that kind of thing. So the computer is just a way to begin, but as you develop it you do it by hand. So it stays 2-d for awhile? Well, eventually it’ll end up maybe being some kind of a maquette [a small preliminary model]. When does it make that kind of a leap? I do a lot of little things like the ones on the fireplace [three small steel pieces]—flat cutouts that are laser cut. Those are done over at BBC Steel in Canby. That’s handy technology. How long would it take to cut these little intricate shapes by hand? That one is maybe ten inches tall —it would take hours? And you’d never get it right. All I have to do for BBC is give them a line drawing. They scan it and it goes into their system—just tell him how many you need and how high and what thickness. To do that by hand, to get the curves right, the straight lines, would be very difficult. You’d need the level of skill of a jeweler. You just wouldn’t do it that way. I mean I wouldn’t do it if I had to go through that. That’s the important thing to say: now you’ll do things that before you just wouldn’t do. And now it allows you to do things you shouldn’t do because it’s so easy. You just send it over to BBC. What’s the point of doing it yourself if somebody else can do it faster cheaper and better and you’re sure it’s going to be correct? And if their machine breaks down it’s their problem. So if you’re building a big piece are you making a small maquette first? What’s the largest piece you would build without building a maquette first? It would depend on the idea. If something was really clear in my head I might plow right into it, but if there’s a lot of material involved and a lot of things I don’t want to have to do twice, then I’ll make a maquette. The other advantage to a maquette, if it’s being cut at BBC, lots of times after I get the maquette I can just modify the original drawing and it’s ready to go. If I’m right in the small one, you figure the big one won’t be a problem. Then you always leave some openings, some things that are going to have to be juggled, so you don’t have it totally mapped out. There’s something about a change in scale that can cause ideas to change. It’s all a relationship to how big people are against how big whatever you’re making is. You can imagine these things pretty easy that size [gesturing to the small works sitting on the stove], but if something’s about three feet high there’s a blank spot—people can’t relate to it very well. I don’t trust that 3-to-5 foot range. 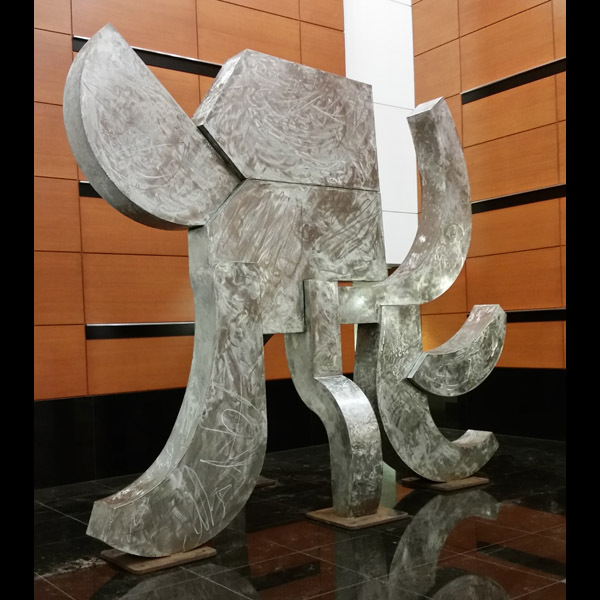 Lee Kelly’s “Akbar’s Elephant” installed at Fox Tower. That idea that a sculpture relates to the physicality of the person seeing it—as abstract as it seems there’s a connection with a human being. And then if you move it into a different environment it becomes totally different. I was thinking of that piece we put in the Fox Tower. Out here it looked gigantic. When you get inside, it has to fit within a space. It takes on a whole different connotation about how you are in relation to it. Out here it was marching through the grass—it had an animation in relation to the plants around it. The pieces really change when they go indoors. And usually for the better. Akbar’s Elephant was the name of that piece. For me that got a lot better when it was in that lobby even though I wasn’t particularly in love with the architecture. At some point you committed to building something that big—12 feet tall— without thinking that somebody’s going to buy it immediately. I kind of think so. So late 90s. There’s a commitment of thousands of dollars of steel in that piece. So there’s a point where you say, “I’m gonna build this thing.” Of course you’ve cut up old pieces so if it doesn’t work out you’ll just make something else out of it. I think I’ve come to accept that. I don’t think I make things thinking they’re going to sell. I probably deep down hope they will. Lee Kelly’s “Akbar’s Elephant” installation in process at Fox Tower. You managed to get that giant piece out of here. How did that happen? It happened with the guys that moved the Sellwood Bridge. Jim Schmidt [who has worked with Kelly before] was in charge of all that [moving Akbar’s Elephant] . How did it happen that somebody decided to purchase them? Elizabeth Leach somehow sold the Fox people. They borrowed pieces for a couple, three, years. Finally they decided they wanted this great big one. They bought it and nobody had any idea if they could get it in the building or not, but those guys were good. They really took care of business. Did you tilt it sideways to get in through the door? We had to cut it apart take it in and re-weld it. You said that every 10 years you want to build a big piece. 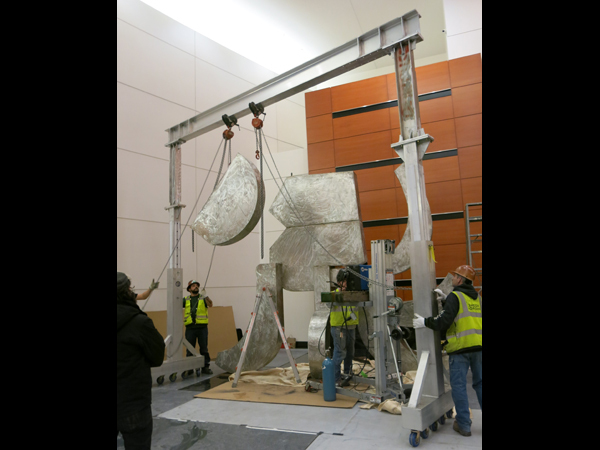 So the one that’s installed by Pacific Northwest College of Art now and Akbar’s Elephant are both those kinds of things? Are you due to build another big piece here soon? If I make it. I’ve got to make it three more years. They have to be done in the last year of the decade. Maybe the thing that I have downstairs could fill in. It’s a pretty good piece—the scale of it is great. I hope we can get it in the gallery. It’s another boat in the basement, putting the boat back in the bottle kind of thing. Does it have any bolts in it? A difference between being a sculptor and a painter is that for the painter you just need a room to put up an easel and you start painting. With sculpture you need tools and equipment and at some point if you’re making really big stuff, you need to have a shop. How did your shop develop over the years? You began with soldering small pieces of brass. When I was in still in school. I had this amazing series of breaks. For the Oregon Centennial  I built these five fountains, and I didn’t even know how to weld or anything—got an acetylene outfit and a bunch of steel and just started folding these things in and tack welding. They probably weren’t very good because the fair people scrapped them out at the end. You have a can-do spirit. What followed that? There was a guy who ran this group call the Liturgical Arts Guild and I got to be the metal guy. We’d get a little chapel to put together and then I get the money to go buy some tools—and then learning how to run the tools. So I’d buy the tool and then have to learn how to use it. With welding stuff that was it. By reading the instruction booklet. No, just by turning it on and hoping for the best. I took welding shop in high school so I at least had somebody show me how to turn it on and do basic stuff. You did it all by yourself. In the mid-’70s you built the hydraulic crane in your shop? About that time, I was hung up on overhead equipment right from the start. Before you just had chain hoists? Chain hoists and those electric traveling hoists. Push a button and they’d go up and down. It became very important to have a way to get three of these lifting devices sort of in one location and then you could pick and roll. And luckily you have a barn to do it in. You moved in here in the ‘60s? And then you got your dozen grinders. At least a dozen. I’m grinding on a thing now. I only use four. I’m cutting back. You have this big piece in process downstairs for your show at Elizabeth Leach. Winter Garden at Muktinath—there’s a sacred spot up in the Himalayas where there is natural gas flame and water coming out of one rock in this cave. This has become a very important pilgrimage site. I did a drawing in the ‘80s and Kassandra [Kelly, Lee’s daughter, who is also an artist] found this drawing said, “Why did you never do anything with this?” Well maybe now’s the time. You’d been to that site? I think I’ve been there five times. There’s a number of shrines that have grown-up over the centuries around the site. So do these forms have a specific relationship the things you saw there? Well, a drawing I did either while I was there or shortly after. There’s a little arch in the wall and then this thing, the tree. You work with a sketchbook on regular basis or just on trips? Mostly when I’m traveling. Then I’ll go back through them here to see if there’s anything I can use. No, I don’t. But it’s been good. Kassandra’s been pushing me to do some more of that sort of mining. You come up with you come up with stuff that probably could’ve or should’ve been built if you looked at it. For a 1983 interview with Lee Kelly by Paul Sutinen, click the link.